Summary: The purpose of this project was to conduct a comprehensive search of the empirical literature published in peer-reviewed journals between 1997 and 2005 to identify studies that presented support for variables included on the HCR-20. This report includes a separate section for each of the measure’s 20 items, with one exception. Empirical support for Items C5 (Unresponsive to Treatment) and R4 (Noncompliance with Remediation Attempts) are presented together under a single heading because studies that were relevant to one item also tended to apply to the other item. Moreover, these studies could not be differentiated on the basis of having a present (clinical) or future (risk management) focus. 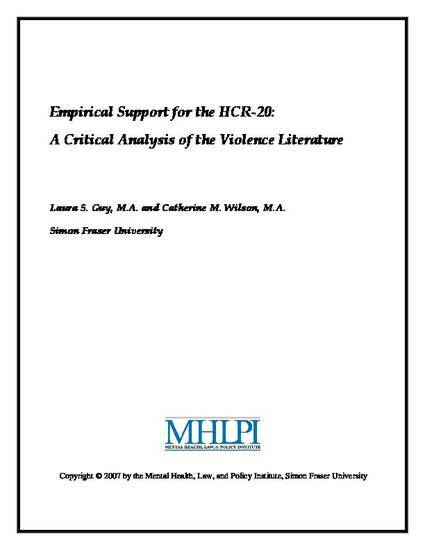 Under each section, the most significant and methodologically sound studies identified in the search are summarized; abstracts of additional studies of relevance to the item are reproduced (with separate headings for studies that presented data on violent or non-vonviolent outcomes). Each section also lists narrative/qualitative literature reviews relevant to the item, as well as studies that offer “contradictory” empirical evidence. A table is presented at the beginning of the report that indicates whether, for each reference, a summary is provided, the abstract only is reprinted, or if it is a narrative review. Bookmark links are provided for each section of this report.